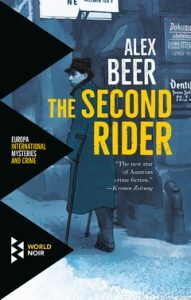 The Second Rider, is a novel by Austrian native Alex Beer translated into English by Tim Mohr and published by Europa Editions. Beer’s debut novel is a historical mystery set in post-World War I Austria where the country and its citizens are struggling, “Austria was but a pitiable remnant barely in a position to survive. Just like its citizens. Everything was in short supply. Food, coal, soap, and clothing. People were starving, freezing, stinking.” Crime is abundant, people turn desperately to fighting, stealing, and prostitution to survive. Suicide rates rise while hungry children steal turnips and men steal the clothes off corpses. No one is immune to the poverty and devastation, not even the veterans who sacrificed so much for Austria. This struggle for survival provides the perfect opportunity for evil men to exploit the starving, suffering people of Vienna, and a smuggling ring led by Viet Kolja adds to the oppression. Kolja and his fellow smugglers profit off the freezing and the starving by creating a black market where they trade simple supplies for money and jewelry—ensuring that once the country gets back on its feet Kolja will be a very rich man. Police Inspector August Emmerich is placed in charge of the hefty task of taking down Kolja and his smuggling ring, but a series of murders steals his attention. In Vienna, Inspector August Emmerich is a veteran with a pesky piece of grenade shrapnel in his right leg that causes him constant pain and drives him to drink and occasionally steal pain pills in order to disguise his weakness from his partner and keep up with the physical demands of his job. If Emmerich reveals the pain his leg causes him he will be confined to desk work, which will destroy his dream of joining the special police division of Lieb and Leben, which handles homicides and other major crimes. When Emmerich stumbles upon the body of homeless and hopelessly shell-shocked Private Jost, he knows it isn’t a suicide and that this is his chance to get the attention of Lieb and Leben. Although he finally has the opportunity to join the most elite division of the police force, Emmerich is faced with the annoyance of a new, inexperienced partner. Ferdinand Winter is a rookie and, unlike Emmerich, has faced never had to face death or hardship. Winter is kind and innocent, “guys like him weren’t used to working. Guys like him weren’t made for times like these.” Winter didn’t even fight in the war, and instead sat on the sidelines, but even more bothersome than his inexperience, are Winter’s endless questions and relentless desire to work according to the rules, to play it safe and call for backup when needed, and his aversion to lying and bribing to get information, or free food, or pain pills, or whatever Emmerich needs in the situation. Winter eventually learns not to ask questions, and not to protest when his partner goes off book, and instead makes himself useful by chasing down leads and pulling his partner back to the investigation they are supposed to be working on. Although Emmerich’s career is on track, and he isn’t homeless or starving like many others, he was not always so fortunate. Emmerich is used to hardship, he grew up in an orphanage and had nothing and no one to care for much of his life. But once he comes back from the battlefield everything changes, “the idea of having his own family had always been an abstract fantasy for Emmerich, but then he’d met Luise and discovered a whole new side of himself.” Luise was widowed by the war and left with three children, and Emmerich falls in love and takes care of her and her sick children, treating them as his own even though he never thought that he would ever fall in love or be the type of man who would enjoy children. But even the joy he has found in his new family, in this miserable aftermath of the war, can be taken from him. All the people that Emmerich trusted perished in the war, and when other veterans, start dying in a suspicious string of suicides that Emmerich strongly suspects to be murders, Emmerich pauses his investigation of Kolja and his illicit smuggling ring and refocuses his attention on getting justice for the men who gave up so much for their country, as well as proving himself capable of becoming a homicide inspector. District Inspector Sander and the city council are extremely displeased with Emmerich’s new course of action, wanting to write off the deaths of the pickpocketing and prostituting veterans as suicides, and bring down the smuggling ring that is extorting their city. Emmerich is not one to be discouraged, however, and is determined to bring down both the sleazy smuggler and whoever is murdering the homeless veterans, no matter how unorthodox the means.